A 14-week extensive rehabilitation project to make a more sustainable Sonoma Overlook Trail is set to begin June 17, 2018, during which time the trail will be closed to the public until mid-September 2018. High usage has contributed to soil erosion and exposure of bedrock, creating unsure footing. Sonoma Overlook Trail (SOT) Stewards worked with noted trail designer Don Beers to identify issues and develop solutions. Beers, who has worked on Montini Preserve and other trails in this region, based his recommendations on trail sustainability principles which include following land contours wherever possible, avoiding harm to natural and cultural resources and disruption of natural hydraulic flow patterns, and constructing trails to withstand the impacts of users and major storm events. The work will be undertaken by a crew of 12 young adults and two experienced trail-building supervisors with American Conservation Experience. Examples of the improvements include; stone steps at the badly eroded main trailhead, a 795-foot reroute to avoid a severely degraded segment on the Lower Trail, rebuilding of climbing turns and junctions, and short runs of steps at key locations to alleviate gradient and erosion issues. The Overlook Trail is on property owned by the City of Sonoma. The City has had a long-time partnership with the SOT Stewards, a committed group of volunteers that maintain and support enhancements to the Overlook Trail. In 2016, the Stewards identified a grant opportunity from the Habitat Conservation Fund (HCF) that would help fund a significant portion of the rehabilitation program. With considerable support from the Stewards, the City of Sonoma applied for a grant in the amount of $55,113. In December 2017, the City Council unanimously adopted a resolution accepting the HCF Grant that, in part, allows for the upcoming construction of the Sonoma Overlook Trail Reroute and Rehabilitation Project. In total, the SOT Stewards have raised $204,000 on behalf of the City of Sonoma to rehabilitate the Sonoma Overlook Trail, in the form of state and local competitive grants, SOT Stewards’ fund raising events, in-kind donations, and generous donations by members of the community, local businesses and community services organizations including contributions from: The Kiwanis of Sonoma Plaza, the State Parks’ Habitat Conservation Fund, Impact100, Wine County Weekend, Scott Evans Foundation, The Fairmont Sonoma Mission Inn, and in-kind contributions from businesses including The Lodge at Sonoma. 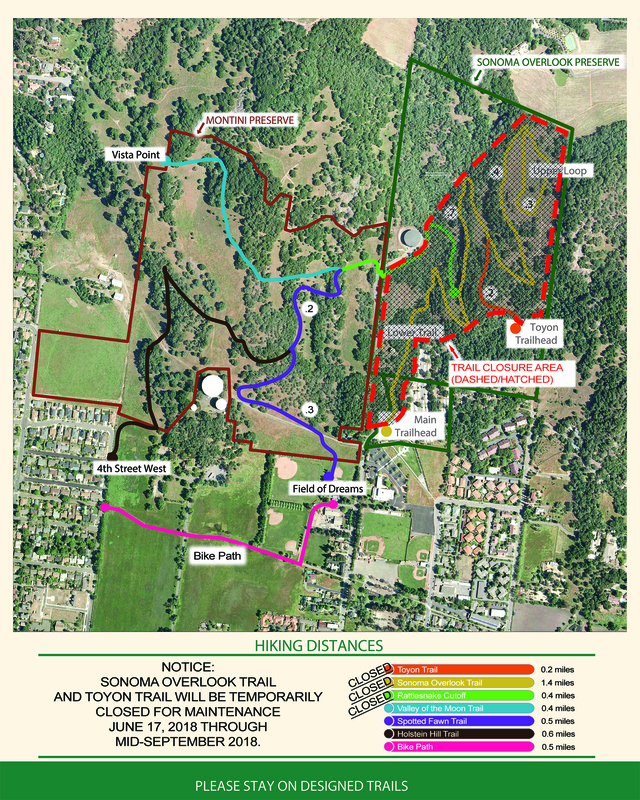 For more information about the rehabilitation project and updates on progress, please visit the Sonoma Overlook Trail Improvement Project Page or overlookmontini.org. Montini Open Space Preserve, Trailhead at Fourth Street West near Haraszthy; and behind the Field of Dreams (adjacent to the police station parking lot). Free Community Hike led by Jeni Nichols every Wednesday 8:30-9:30 during the Overlook Trail closure, meet in the police station parking lot. See a trail map. The Sonoma Bike Path, Nathanson Creek Parkway, Fryer Creek Trail, download the Sonoma Bicycle Map to see trails and connecting streets.